Having all students buy into the curriculum by doing and participating, rather than passively listening or fearing a bad grade. That is PBL. I remember studying art history and getting a “C” on a contemporary art test, that was 29 years ago and I have not forgotten the grade but I have forgotten what was on that test. Then I remember going to a museum and guiding students around and having fun helping them understand contemporary art. The interaction, hearing their ideas, sharing our understanding and creating new meanings and then creating new art is authenic PBL education. Jeffrey Robin has been teaching high school for 27 years. He is a founding faculty member of High Tech High in San DIego and has remained an active collaborative project based learning teacher at HTH. He also leads PBL workshops around the world and remains a practicing artist. How do you do create a PBL classroom? Doing something is the key. You learn so many thing that you could never know by just talking or giving an assignment. The act of doing and showing what you have done or made and created brings a real world authenticity to your students and the school community. This course will have you define the intersection of your educational and personal passions with what you really like to do. This way you can develop an authentic educational projects for your students to do in your content area. Then you will “Do Something”, documenting your process and your exemplars. Finally you will develop a management plan that will enable your students to be successful and make beautiful work. Do the project yourself, first! Shed the Twentieth Century ideal of what education should be and create your own meaning of what education can be. Think about these questions as you work? What is keeping me from being successful? Did I finish in the time I expected? Did this get my point across? Does it meet my personal learning goals? Will I be able to do this with all my students/teacher? Can I make it sticky? We want beautiful work on time. I need to say this because many apologists say, “it is good to fail, you can learn a lot from failure!” That is true, and your students would then need to figure out what went wrong and become successful. But the teacher needs to plan for the kinds of failures that occur with their students. If the teacher planned well, time to fix failures is built into the project. That is one more reason to do the whole project yourself, first. I dislike that PBL hinges here in the beginning with adults doing something. It’s not that I think adults can’t do things. I am an adult and I am busy with work, family and life. I have already been to school why do I have to do it again. How come this art teacher from San Diego is telling me to do this? I have been down this road twice a year for 17 years with 34 plus projects, 20 partners, you can try to do PBL without doing it yourself first, but you will not be successful, and success is having all students participate in the project and creating something that they are proud to exhibit. 1. What is your educational passion? 2. What is your personal passion? 3. When you are not working what do you like to do? 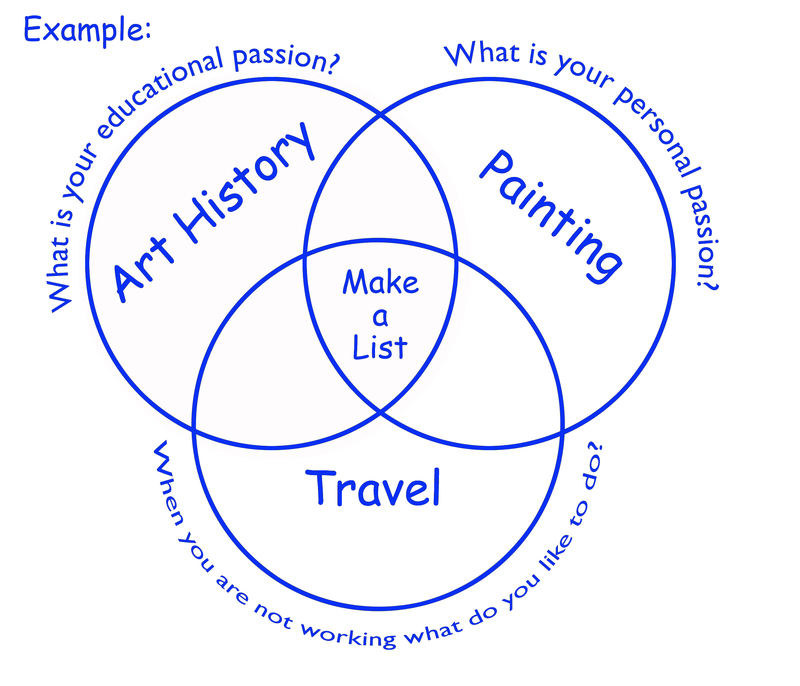 In a venn diagram answer these question and then write a list of things that could fit in the intersection of things that you could “do” that would encompass all of these passions. Here is my EXAMPLE. I always do the project or assignment myself, no matter how big or small. Post Christo. Design and decorate a space, the opposite of what Christo did. Digital-Baroque. Visit museums and have the students find Baroque paintings and digitally alter them in Photoshop and then paint the new digital image. Write yourself into Art History. 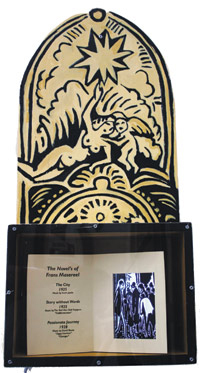 Study art history and find an artist. Do art like them and using your paintings write the art history text for them and then make three of your own paintings writing yourself into history as well. Compile your own list, at least five different ideas. 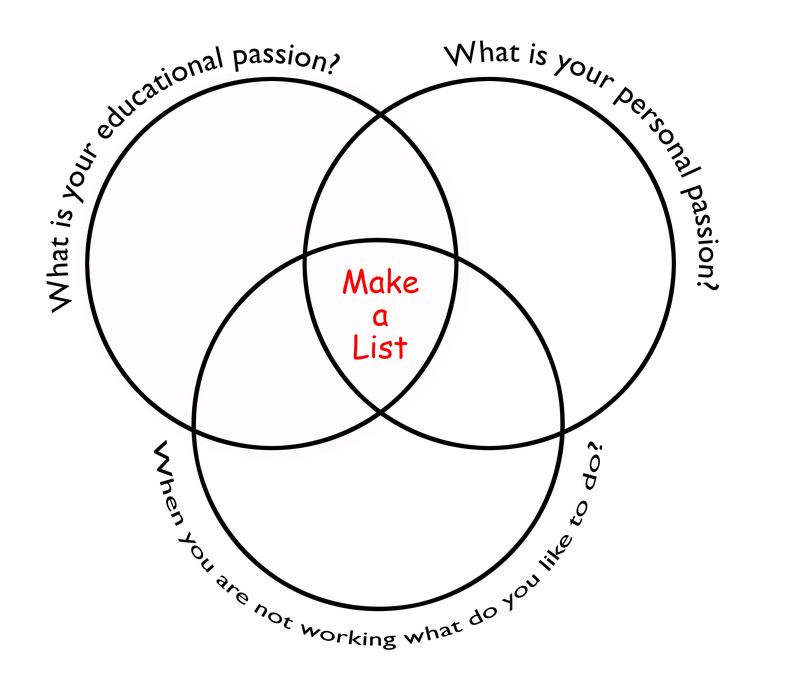 Think about your passions and how to motivate all your students. Doing and having fun should be on the top of your list. If you are collaborating with another teacher, is there an authentic bridge to their subject area too? Determine the idea that most appeals to you. This is important, not the idea but make a determination that you are going to do something. If it is a bad idea do another one, but you have to be determined to do something. Do the project: Write down what you think you are going to have when you are finished. What will you have learned during this process? There will be many more learning experience that you can add to this list after you complete your project. Think about your learning goals, subject area, is this fun for your students and is it fun for you while designing and doing this project. I need to pick an artist. I know many, unlike most of the students. This is something to think about: How will I get the students to choose wisely? I think I want them to use modern masters ie after 1850, post photography. An artist that I have alway enjoyed but have never researched is David Hockney. As I checked on the internet he has had multiple painting and photographic styles. He has a deep connection to art history and technology. I looked at Wikipedia and then I got a book at the library, “Hockney Secret Knowledge”. After reading and looking at his work over a lifetime, I think his work is about multiple point perspective. ​From his Mulholland Drive painting like 10th century Japanese paintings to his “Joiners,” a collage of photographs that together build an image and from different angles and multiple points of perspective. His life's work of multiple point perspective come together in his iPad paintings. The app he uses, “Layers,” allows the artist to have the image on a layer so that you can move the source image to where the artist needs it. You can also paint at night, which is a really cool groundbreaking perspective. This is another important aspect about the project: The students need to find a theme in the artist’s work. Here are the works that I made in Hockney’s style. Point Loma, this painting is after Hockney's Mulholland Drive. 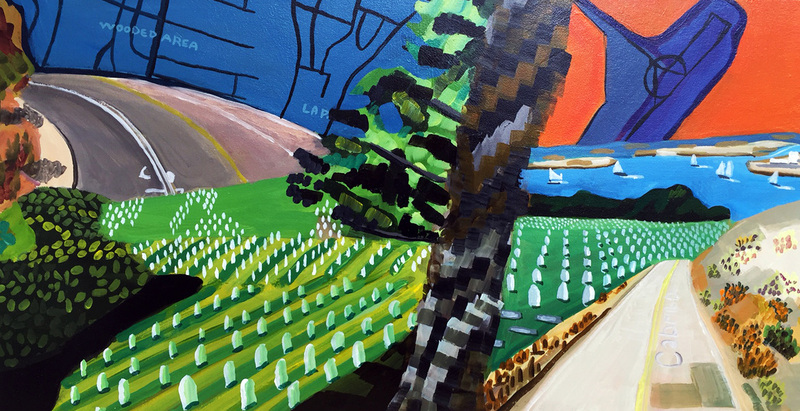 Similar to the Hockney, this painting has multiple perspectives in one picture frame and has loose brushstrokes, free and vibrant color, and it is California, a favorite theme of Hockney's in the 1980s to 90s. All of these source images came from Google Maps; Google didn't exist back then but with his embrace of tech in the last few years I think he would have. 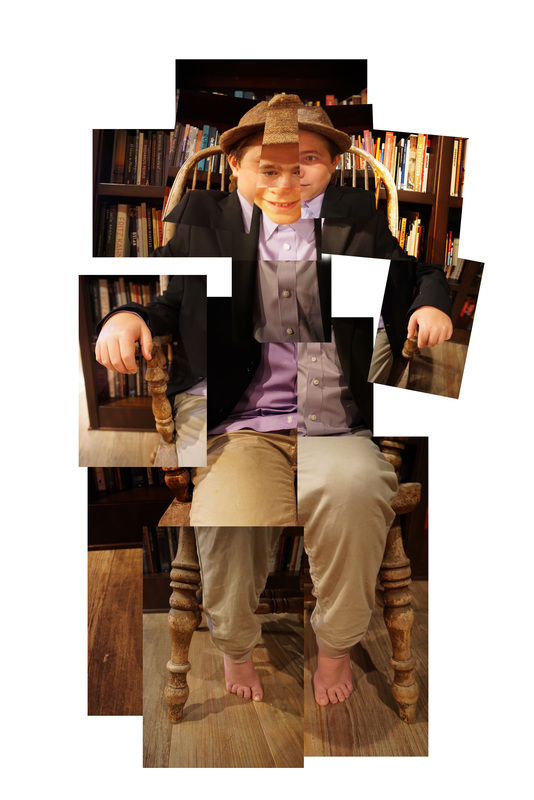 This image, Boy in the Hat, is in the style of Hockney's multiple perspective photo collages where he used multiple photos to create a large image that represented the image. This is clearly where Picasso's analytical cubism influenced Hockney's MSR (Method, Subject & Reason). 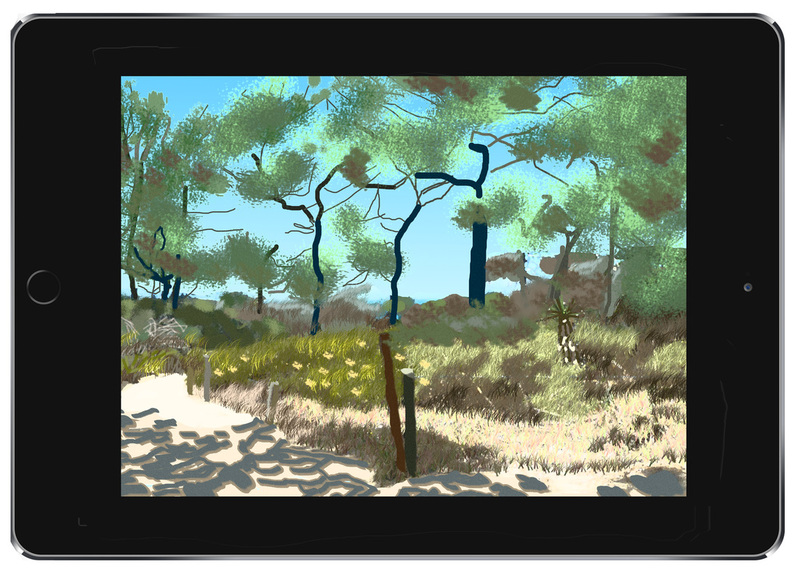 "Hockneyesque" Ipad painting using the Layers app enables quick and easy plein air painting in daylight or at night. 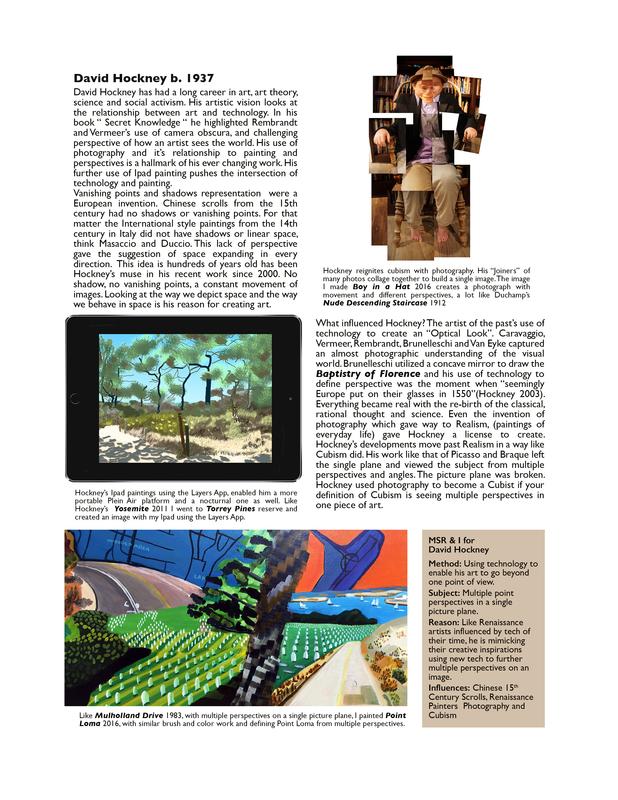 This use of technology is Hockney's equivalent to the Renaissance and Baroque painters use of the camera obscura. This is my interpretation of his style. The next step is to write about Hockney like I am an historian. This could be messy, with so many different students I probably should set up specific content areas for them to cover. Something to think about, How will I have a similar content about each artist so that this book feels cohesive? 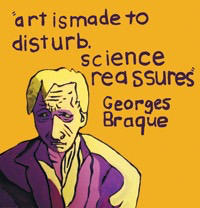 The way I handled it was to explain the theme of the artist's work and then explained his method of creation, subject of his work and the reason he created what he did. Method, Subject and Reason* is what I feel as the teacher is the least they should know about the artist and their work. Here is my example of the page that I made and I will have my students make. *Method, Subject and Reason is my distillation of art history or the least you should know. This is what the students will hand in for the first part of this project, three pices of art in the style of the artist they researched and a art historical write up. I should have made a double page spread not just one page.There is too much information and the images should be larger as it is an art history book. After you do the project you are in a much better place to know the pitfalls, the hard parts and, frankly, was the project worth doing. Make small examples of their work There will not be a lot of time to make large works, 48 students making 4-5 paintings, I will need to limit the size of the work. This was Planning, having an exemplar of the project and a list “have to” and “better not’s”. You will need your exemplars and your list for the next assignment: coming up with a management plan. 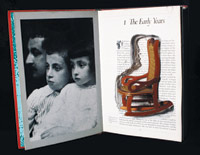 What Can You Hide in a Book? Students will brainstorm different concepts that can be represented in their books. We will critique their ideas in class. The students will make mockups in Photoshop of their ideas, incorporating qualities like these: Something disturbing, Something that shows classicism, mythology, social injustice, love, desire, how open-minded you areand more. A good example of this is a project I designed last year: Analog Flash for Windows (for a full description, go to jeffrobin.com. 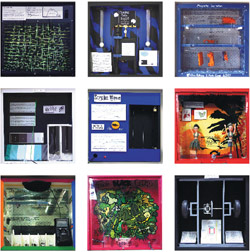 In this project, students had to work in pairs to make an interactive art piece that explained a physics or mathematics concept for installation in a 24” x 24” x 5” window box. As you can see here, we got a lot of different results, but they all look connected to each other. Assignment Three: Developing a Management Plan. Project management is the second most important component to PBL, after you have made an exemplar. You know so much now: does the project align with your learning goals? What were the steps you took to have a successful project? Was the project doable? And, most importantly, was it fun? engaging? compelling? interesting? Please watch: Planning and Letting go. What is the payoff of good planning? What can you do to keep track of students progress? What structures can you put in place to have all students be successful? How will you define success for your students? Your planning helps you calendar out your project. You need to design a process that your students can follow and no one falls through the cracks or games the system. Another big problem new PBL teachers go through is bottlenecks, having students waiting around for support, materials, access to tools or waiting for feedback from the teacher. You may have multiple deliverables going at the same time that they can be working on when they are stuck on something else. An obstacle to effective PBL practices is that teachers often feel that they need to front load projects, giving the students all the information up front. The problem with this approach is that students lose the focus of the project and many become disengaged. And it misses the point of doing PBL in the first place. PBL provides students with the opportunity to realize at points through the project that they need more knowledge, skill or resources to be able to move forward. Setting up a classroom that encourages them to seek what they need when they need it more closely resembles the process adults in the real world go through to accomplish their objectives. Giving the students all the information up front is crushingly boring and you miss the students you are trying to reach, the kids that learns by doing. Here are the steps for your project management planning. Make a Calendar for every day of the project. What will the students be doing and what comes next. First time I had to do this I was angry, I felt like my spontaneity was going to be hampered. Then I realized it made my life and job so much easier. The students and their parents liked it too. Exhibit the Deliverables On your website, Google Classroom, Shared Doc, etc develop a digital way for your students to access your Deliverables and your Calendar at home. Classroom Visual This is a display of your work that the students can see in class. We want the students to learn and critically understand the difference between good work and work that just isn't finished yet. Seeing your work as an exemplar will give them a tool to develop this skill. This is also a great vehicle for administrators, other teachers and parents to see what is going on in your classroom. Answer 4-7 what would you add to your plans and what would you keep out?